Let pie crusts stand at room temperature according to package directions. Line a 9-inch deep-dish pie plate with foil, extending foil 1 inch beyond edges of plate; set aside. In a small bowl, combine granulated sugar, flour and cinnamon; set aside. Spread 2 tablespoons of the softened butter over foil on bottom of pie plate. Press the 3/4 cup pecan halves, round sides down, into butter. Pat brown sugar into butter. Unroll pie crusts. Place 1 of the pie crusts over pecan mixture; press onto bottom and up sides of pie plate. For filling: Arrange apple slices in pastry lined pie plate. Sprinkle half of the cinnamon mixture over apples. Arrange pear slices over apples. Sprinkle the remaining cinnamon mixture over pears. Melt the remaining 2 tablespoons butter; stir in lemon juice. Pour butter mixture over filling. Top with the remaining pie crust. Fold top pie crust under bottom pie crust and pinch together to seal. If desired, crimp edge. Cut slits in top pie crust. To prevent overbrowning, cover edge of pie with foil. Bake in a 400 degree F oven for 10 minutes. Reduce oven temperature to 350 degree F. Bake 20 minutes. Remove foil. Bake 45 to 55 minutes more or until fruit is tender and filling is bubbly. Cool on a wire rack. To serve, invert pie onto a large cutting board. Lift off the pie plate and carefully peel off foil. Cut pie into 10 wedges. 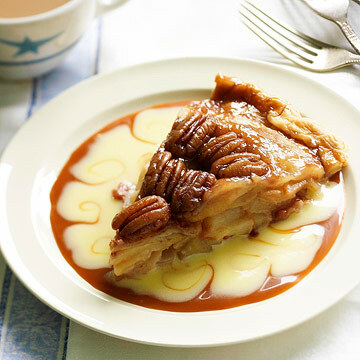 For each serving, spoon about 3 tablespoons of Creme Anglaise onto each dessert plate. Make a ring of caramel ice cream topping around plate and swirl. Place a pie wedge in center of plate. Top with a dollop of Sweetened Whipped Cream. Sprinkle additional pecan halves on top. Makes 10 servings. In chilled large mixing bowl combine whipping cream, sugar and vanilla. Beat with an electric mixer on medium speed until soft peaks form. Makes about 2 cups. In a heavy medium saucepan, bring whipping cream just to boiling, stirring frequently. Remove from heat. In a medium mixing bowl, combine about 1/3 cup of the hot cream, sugar and egg yolks. Beat with an electric mixer on high speed for 2 to 3 minutes or until thick and lemon-colored. Gradually stir about half of the remaining cream into the egg yolk mixture. Return all of the egg yolk mixture to the saucepan. Cook and stir over medium heat just until mixture returns to boiling. Remove from heat. Stir in vanilla. Immediately place saucepan in a large bowl half filled with ice water. Stir for 2 minutes to cool quickly. Transfer cream mixture to a serving bowl. Cover surface of cream with plastic wrap. Chill for at least 2 hours or overnight. Makes about 2 cups.